Bone tissue is continuously remodeled through the concerted actions of bone cells. Whereas osteoblasts synthesize the bone matrix and are responsible for its mineralization, osteoclasts break down bone matrix. The third cells, osteocytes, are inactive osteoblasts that have become trapped within the bone they have formed. The small space containing the osteocyte is called lacuna. When the tissue is dead, the lacuna topography gives information about the osteocyte that occupied it before. 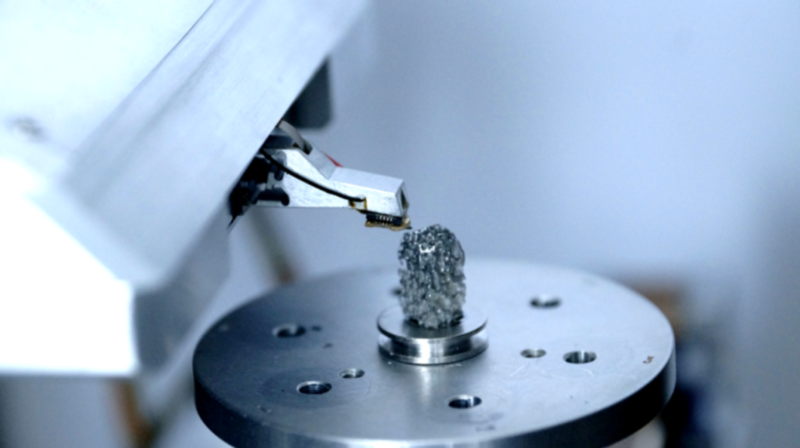 This is particularly advantageous when the sample is extremely difficult to reach with the AFM cantilever as in the case of bovine vertebra. AFSEM<span class=”registered-trademark”>®</span> combines the strengths of both SEM and AFM for a quantitative analysis of bone structure. SEM’s large field of view enables identifying lacunae in bone tissue and the precision of the SEM is used for positioning the cantilever directly onto lacunae. Scanning electron microscopy can help to identify lacunae in bone structure. However, quantitative height information is not available in SEM. Atomic force microscopy is an established tool for quantitative analysis, however, it is very difficult to access lacunae without optical guidance. AFSEM® is a dedicated solution where both imaging modalities are integrated within one instrument. The main advantage is that it becomes easy to apply SEM and AFM in situ at the exact same spot of sample. AFSEM® ensures SEM-guided easy identification and cantilever positioning on lacunae in bone structure and enables complementary SEM and AFSEM® 3D topography information of lacunae and collagen fibers. AFSEM® enables quantitative 3D analysis of collagen fibers with sub-nm resolution. Correlative AFM/SEM microscopy allows for complementary SEM and AFM topography information of lacunae and collagen fibers. Real 3D representation of the topography can be used for analyzing collagen fibers with high resolution. Quantitative analysis of the AFSEM® data reveals characteristic 67 nm periodic banding pattern on collagen fibers with sub-nm resolution. The cross-section of the banding pattern shows a corrugation height of 3 nm. In summary, AFSEM® is the solution of choice to obtain correlative AFM/SEM microscopy analysis. It accepts any sample that fits the SEM/FIB. SEM-guidance makes the identification and cantilever positioning even on very complicated samples very easy. 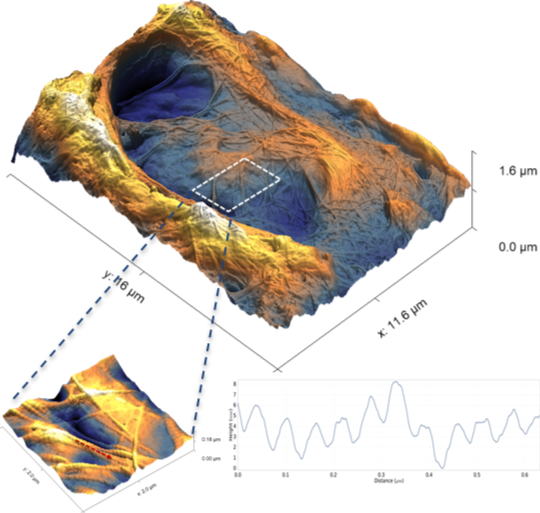 AFSEM® enables quantitative 3D analysis of features with sub-nm resolution.